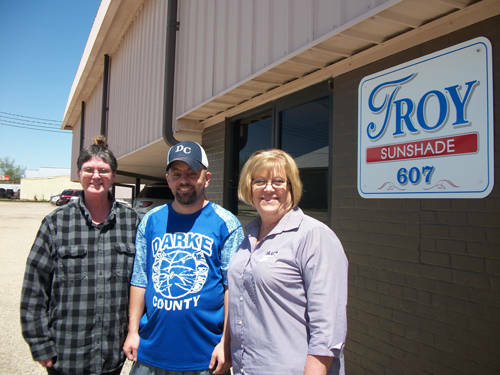 Troy Sunshade employees (l-r) Connie Meade and Devin Billenstein are pictured with Kim Longfellow, company president and general manager. DARKE COUNTY – Troy Sunshade donated to Darke County Special Olympics again in the name of Devin Billenstein, a special needs athlete and employee at Troy Sunshade. A fellow athlete, Nick Meade, is the son of Connie Meade, also an employee there, according to Kim Longfellow, company president and general manager. Devin Billenstein along with Connie Meade’s son, Nick, participated in basketball and softball. This summer Darke County Special Olympics focuses on softball, power lifting and unified golf. The latter is during which a typical adult is paired with a special needs athlete. Darke County Special Olympics is totally organized, coached and run by volunteers and supported by Darke County individuals, organizations and businesses.